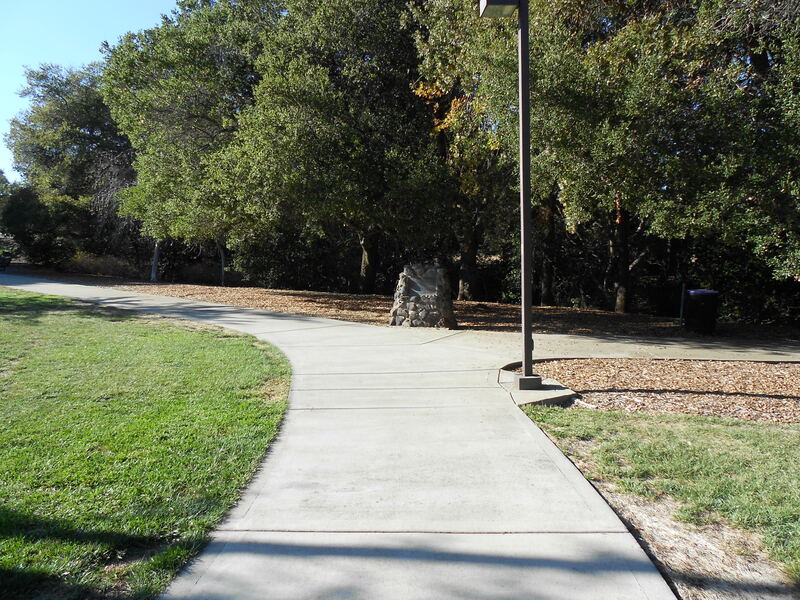 TO THE GOOD LIFE WE ENJOY TODAY. 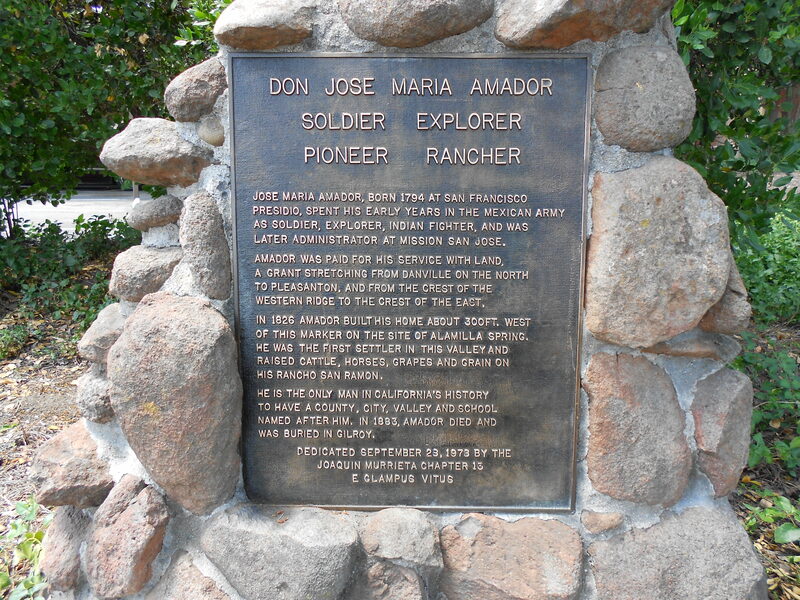 HIS EARLY YEARS IN THE MEXICAN ARMY AS SOLDIER, EXPLORER, INDIAN FIGHTER, AND WAS LATER ADMINISTRATOR AT MISSION SAN JOSE. 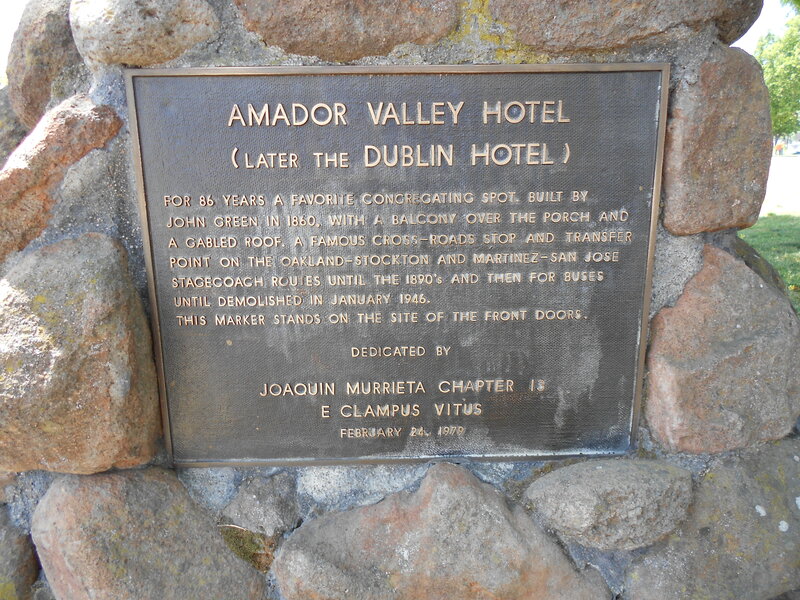 OF ALAMILLA SPRING. 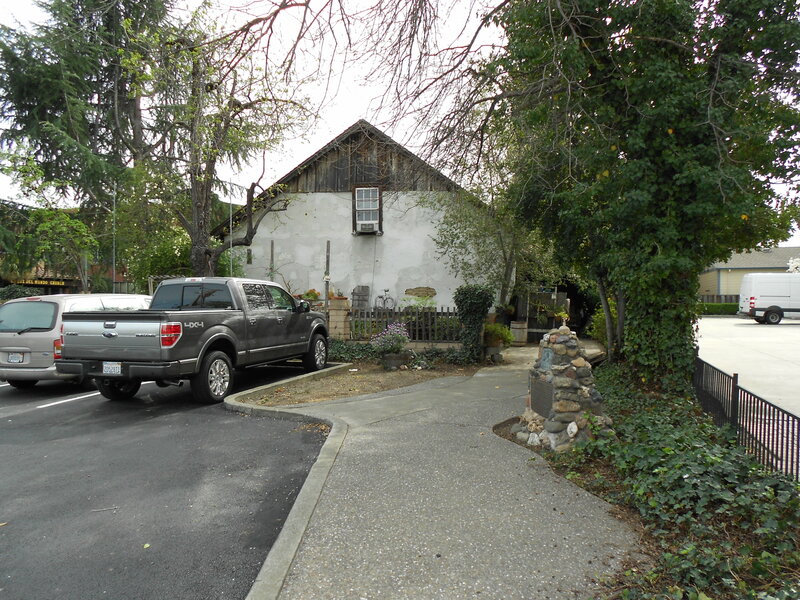 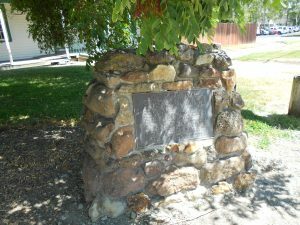 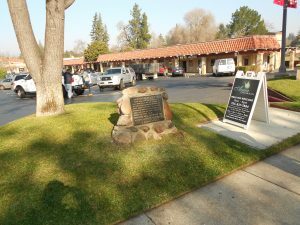 HE WAS THE FIRST SETTLER IN THIS VALLEY AND RAISED CATTLE, HORSES, GRAPES AND GRAIN ON HIS RANCHO SAN RAMON. 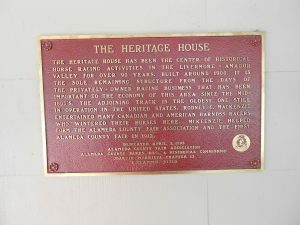 UNTIL DEMOLISHED IN JANUARY 1946. 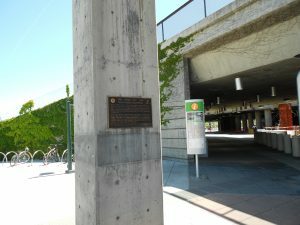 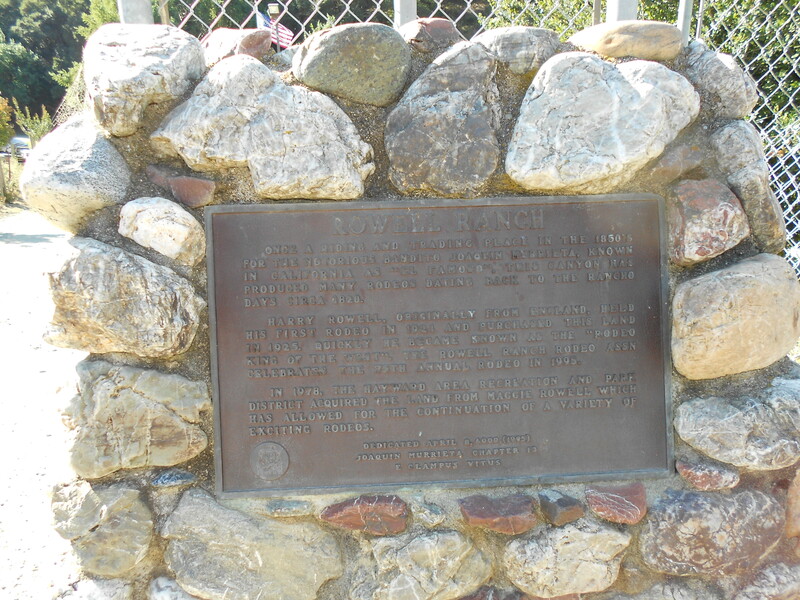 THIS MARKER STANDS ON THE SITE OF THE FRONT DOORS. 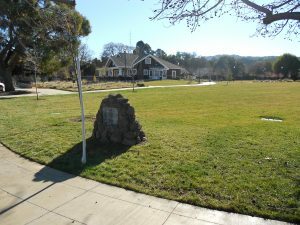 FRANCISCO BANK. 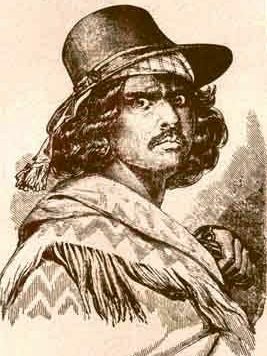 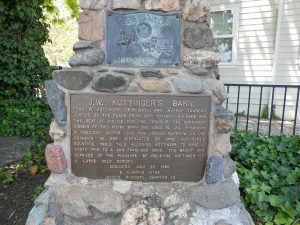 THE BANDIT WAS DEPRIVED OF THE PLEASURE OF RELIEVING KOTTINGER OF A LARGE GOLD DEPOSIT. A NEIGHBORHOOD PUB, AND NOW IS A RESTAURANT. 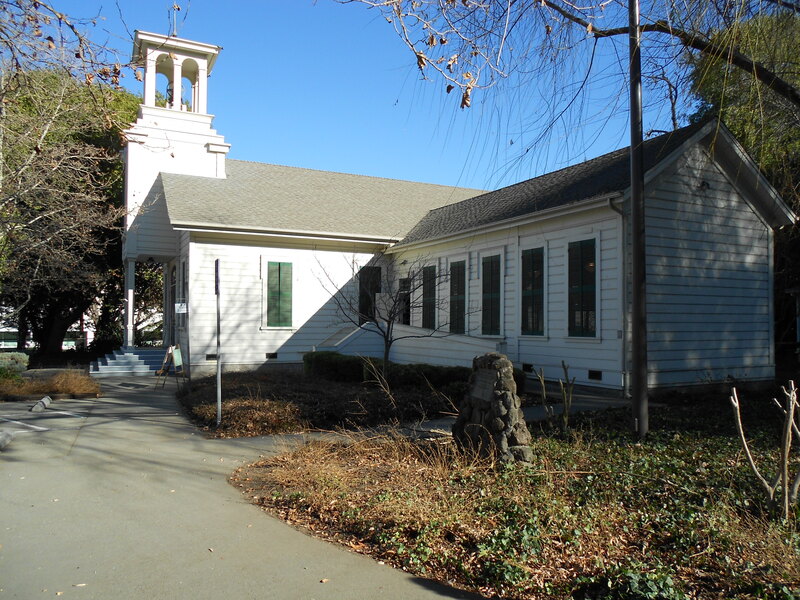 FROM 1914-1948 THE NORTHEAST CORNER OF THE BUILDING WAS THE DUBLIN BRANCH OF THE ALAMEDA COUNTY LIBRARY. 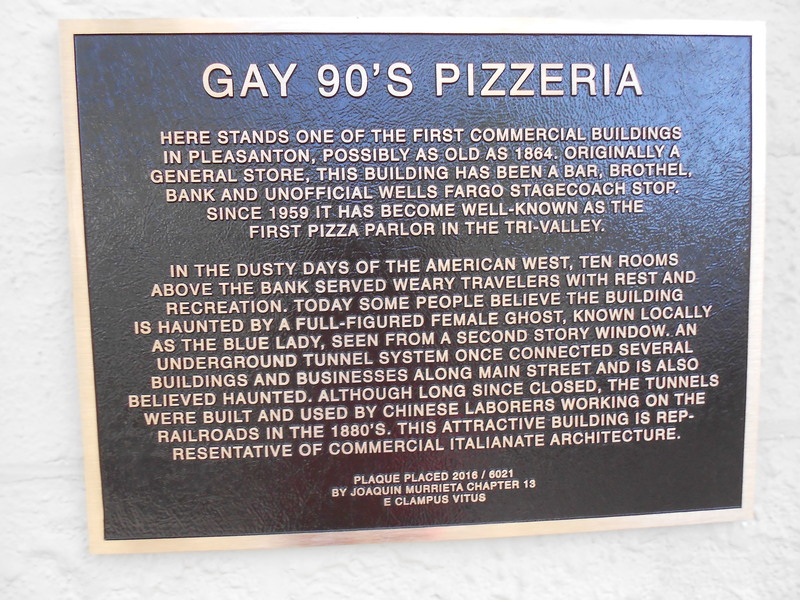 EXPANDED IN 1984 BY THE STAR FOODS CORPORATION. 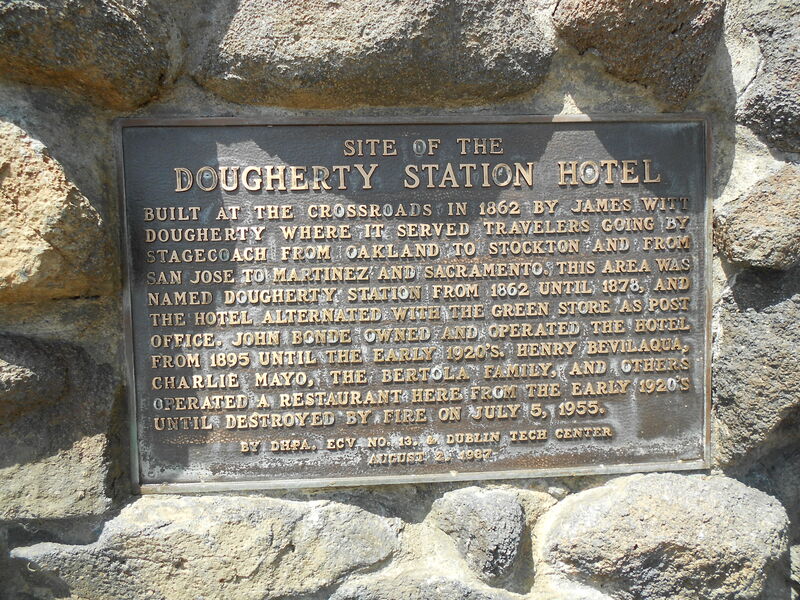 IT SERVED TRAVELERS GOING BY STAGECOACH FROM OAKLAND TO STOCKTON AND FROM SAN JOSE TO MARTINEZ AND SACRAMENTO. 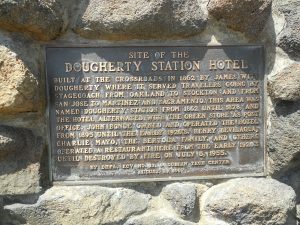 THIS AREA WAS NAMED DOUGHERTY STATION FROM 1862 UNTIL 1878, AND THE HOTEL ALTERNATED WITH THE GREEN STORE AS POST OFFICE. UNTIL DESTROYED BY FIRE ON JULY 5, 1955. ON FEB. 8, 1871 TWO MEN, THE NAMES OF NEAL F. TAYLOR AND TIMOTHY COX, WERE LOOKING FOR COAL IN THE AREA FOUND MORE THAN THEY WERE LOOKING FOR. 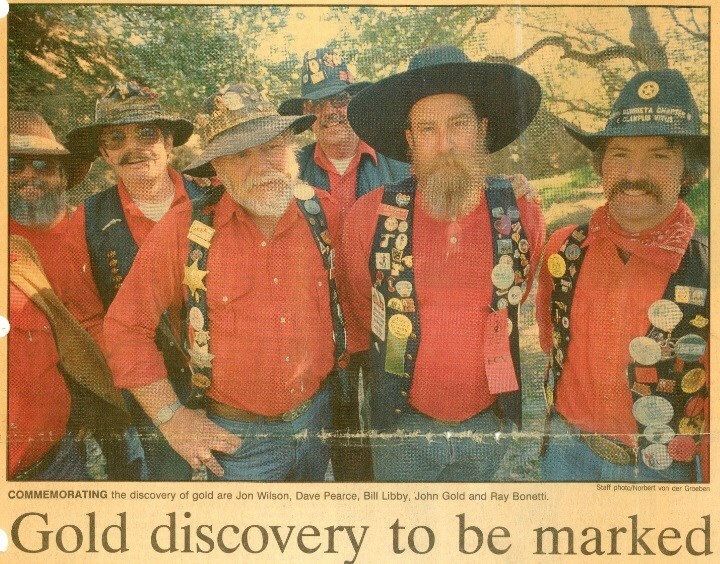 ON THE CREEK WHICH COMES DOWN THROUGH THE DOUGHERTY RANCH THE TWO MEN FOUND GOLD FLAKES AND GOLD DUST. 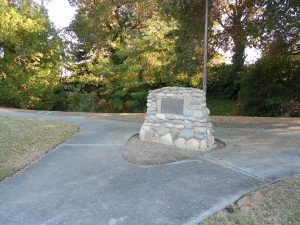 SOON OTHERS HEARD OF THIS AND THERE WAS A GRAND RUSH TO GOLD CREEK. 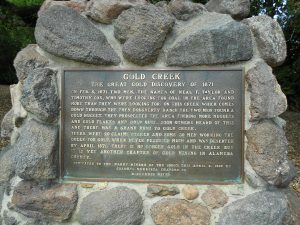 THERE WERE 20 CLAIMS STAKED AND SOME 30 MEN WORKING THE CREEK FOR GOLD, WHICH NEVER PRODUCED MUCH AND WAS DESERTED BY APRIL 1871. THERE IS NO LONGER GOLD IN THE CREEK BUT IT IS YET ANOTHER CHAPTER OF GOLD MINING IN ALAMEDA COUNTY. 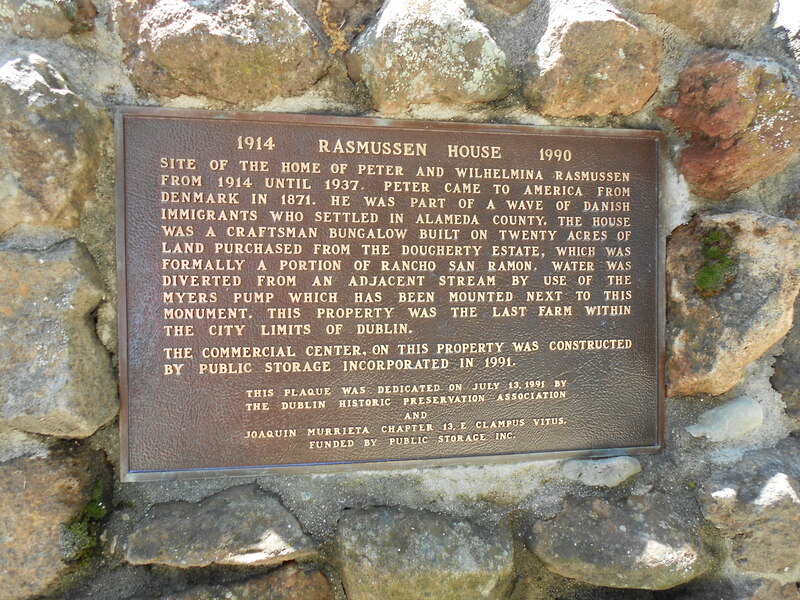 Additional Info : F E Myers Co.
SITE OF THE HOME OF PETER AND WILHELMINA RASMUSSEN FROM 1914 UNTIL 1937. PETER CAME TO AMERICA FROM DENMARK IN 1871. 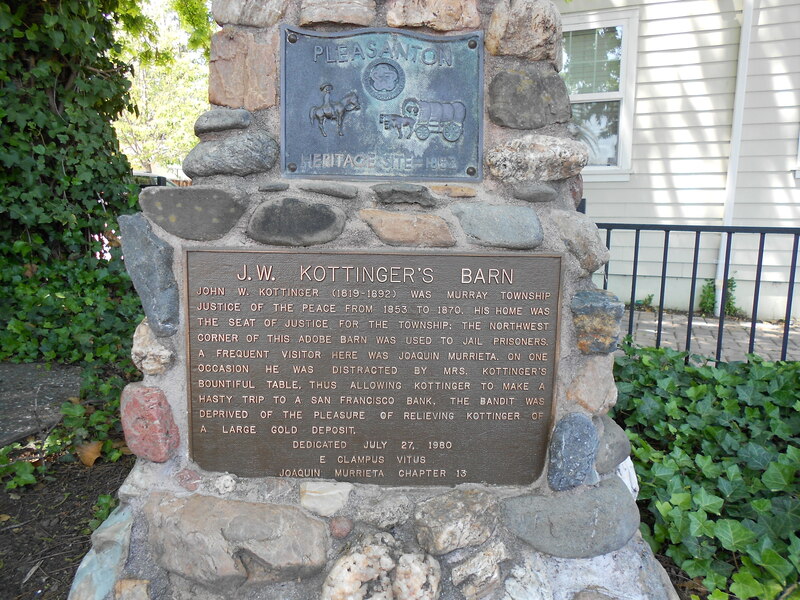 HE WAS PART OF A WAVE OF DANISH IMMIGRANTS WHO SETTLED IN ALAMEDA COUNTY. 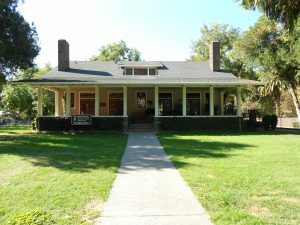 THE HOUSE WAS A CRAFTSMAN BUNGALOW BUILT ON TWENTY ACRES OF LAND PURCHASED FROM THE DOUGHERTY ESTATE. 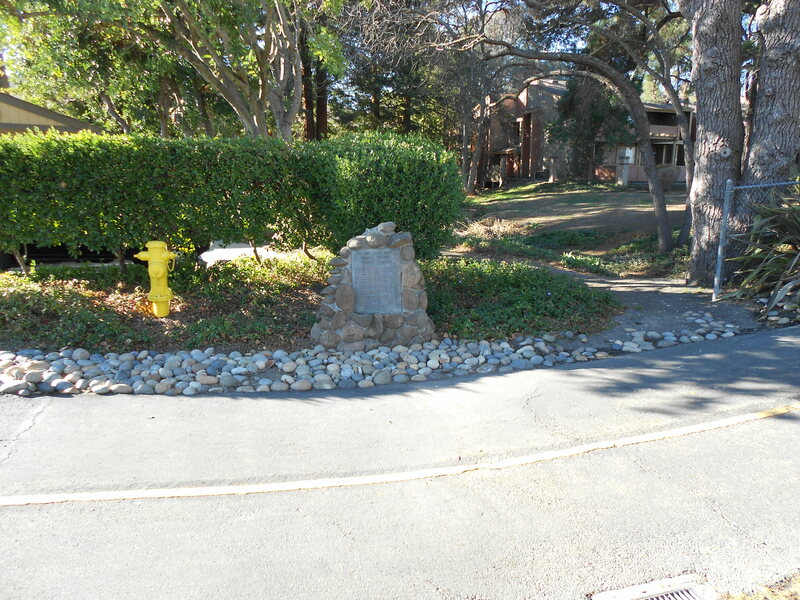 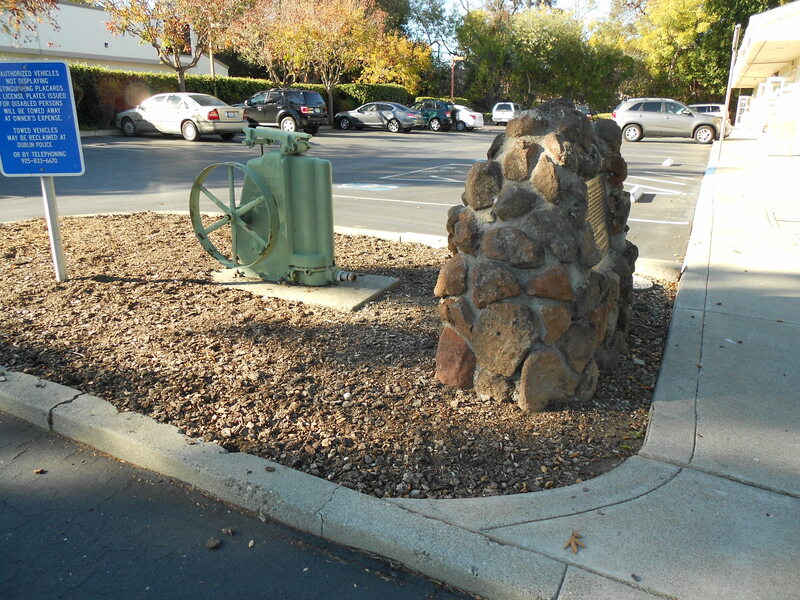 WATER WAS DIVERTED FROM AN ADJACENT STREAM BY USE OF THE MYERS PUMP WHICH HAS BEEN MOUNTED NEXT TO THIS MONUMENT. 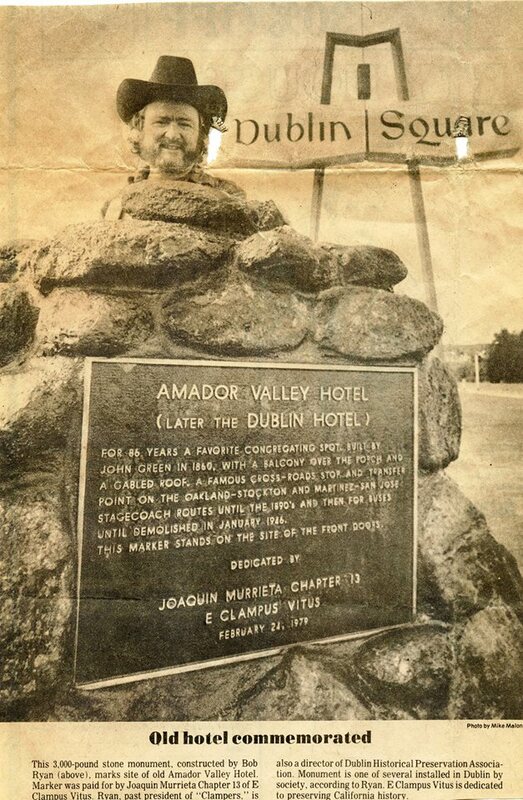 THIS PROPERTY WAS THE LAST FARM WITHIN THE CITY LIMITS OF DUBLIN. THE COMMERCIAL CENTER ON THIS PROPERTY WAS CONSTRUCTED BY PUBLIC STORAGE INCORPORATED IN 1991. 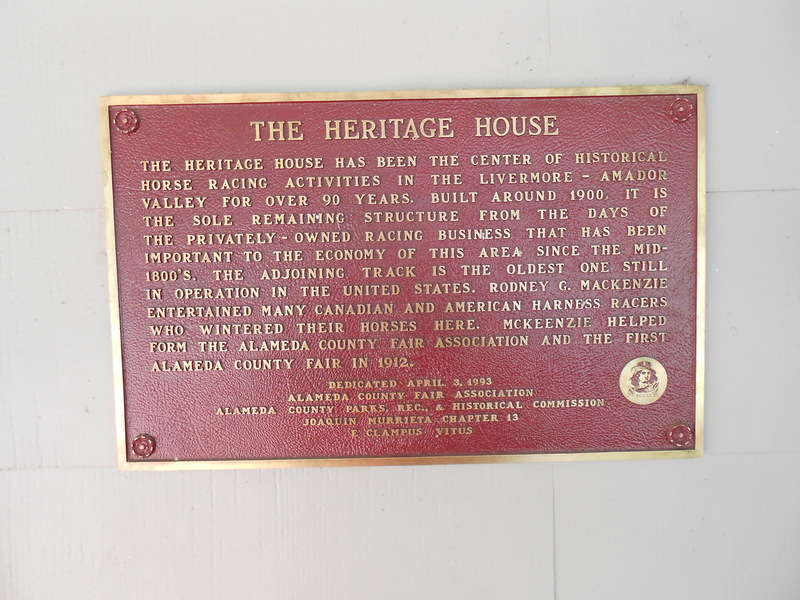 FUNDED BY PUBLIC STORAGE INC.
AND THE FIRST ALAMEDA COUNTY FAIR IN 1912. 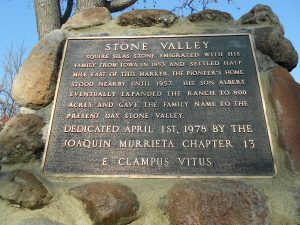 JOAQUIN MURRIETA, KNOWN IN CALIFORNIA AS EL FAMOSO THIS CANYON HAS PRODUCED MANY RODEOS DATING BACK TO THE RANCHO DAYS CIRCA 1820. 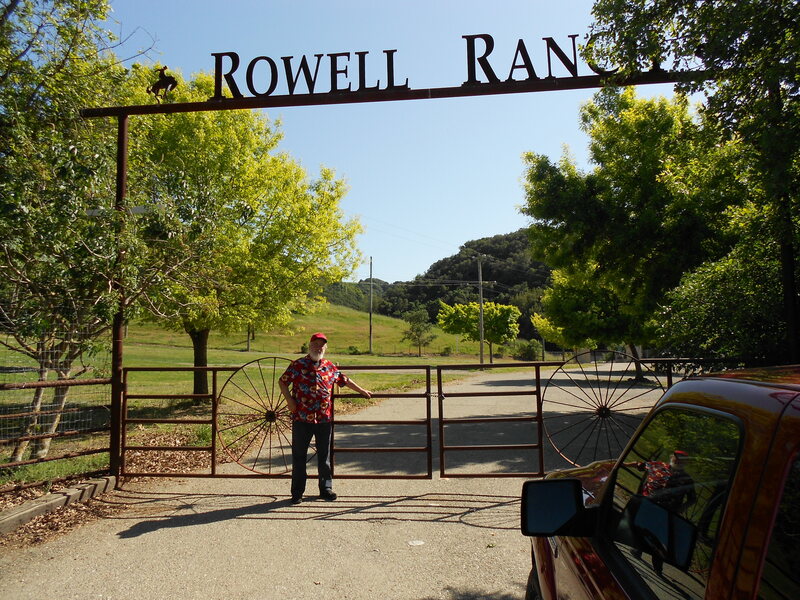 HARRY ROWELL, ORGINALLY FROM ENGLAND, HELD HIS FIRST RODEO IN 1921 AND PURCHASED THIS LAND IN 1925. 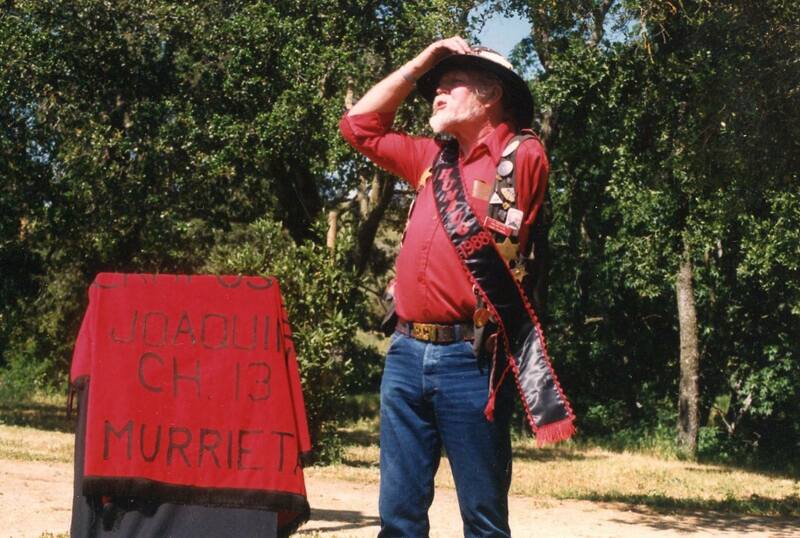 QUICKLY HE BECAME KNOWN AS THE RODEO KING OF THE WEST. 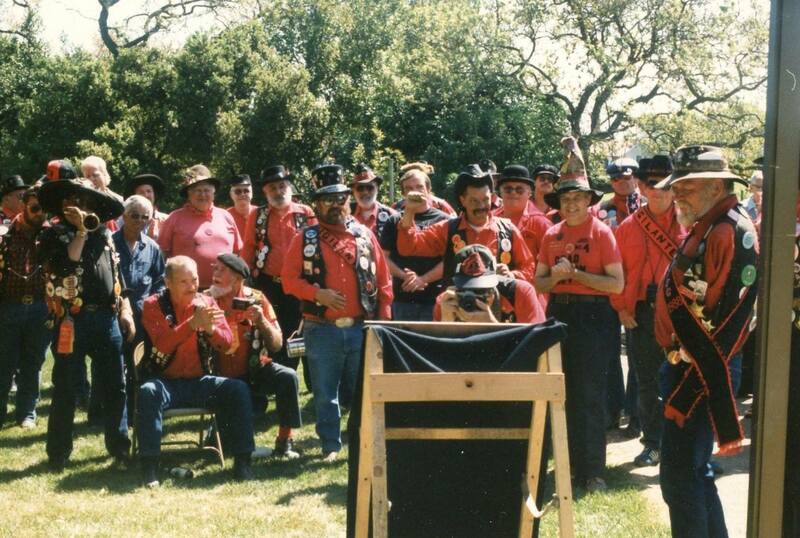 THE ROWELL RANCH RODEO ASSN CELEBRATES THE 75TH ANNUAL RODEO IN 1995. 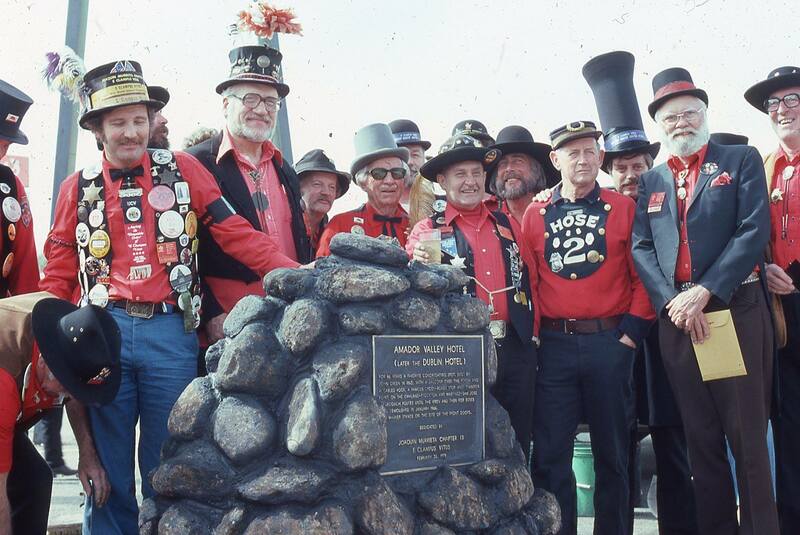 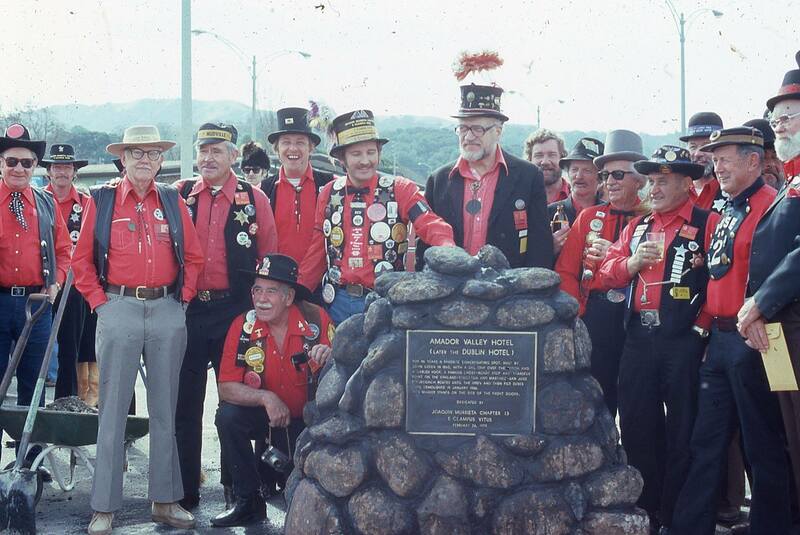 IN 1978, THE HAYWARD AREA RECREATION AND PARK DISTRICT ACQUIRED THE LAND FROM MAGGIE ROWELL WHICH HAS ALLOWED FOR THE CONTINUATION OFA VARIETY OF EXCITING RODEOS. 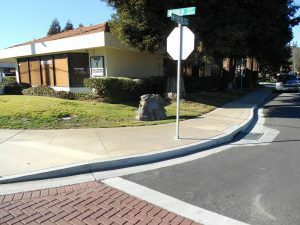 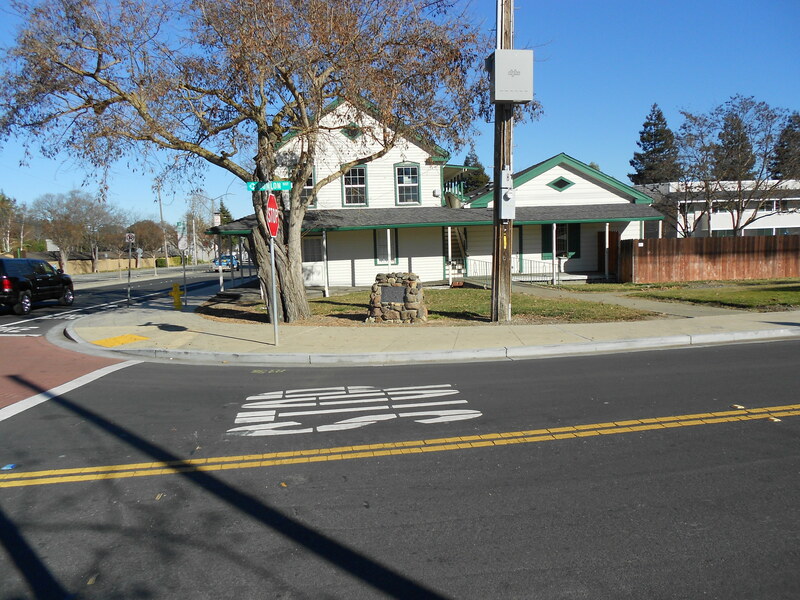 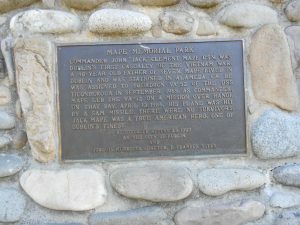 MAPE LIVED IN DUBLIN AND WAS STATIONED IN ALAMEDA, CA. 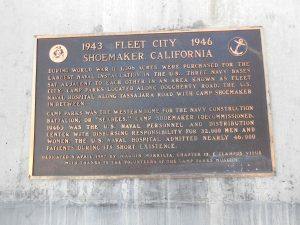 HE WAS ASSIGNED TO SQUADRON VA-52 OF THE USS TICONDEROGA IN SEPTEMBER, 1965. AS COMMANDER, MAPE LED THE VA-52 ON A MISSION OVER HANOI. 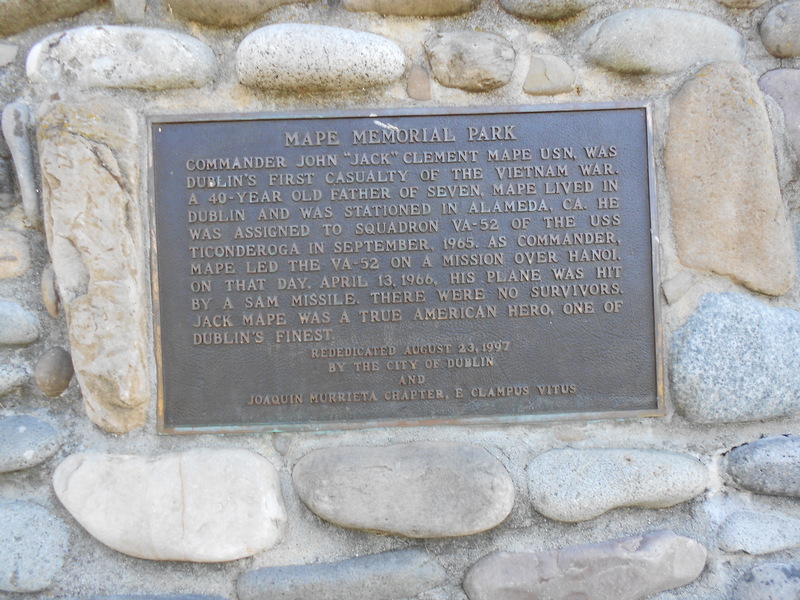 ON THAT DAY, APRIL 13, 1966, HIS PLANE WAS HIT BY A SAM MISSLE. 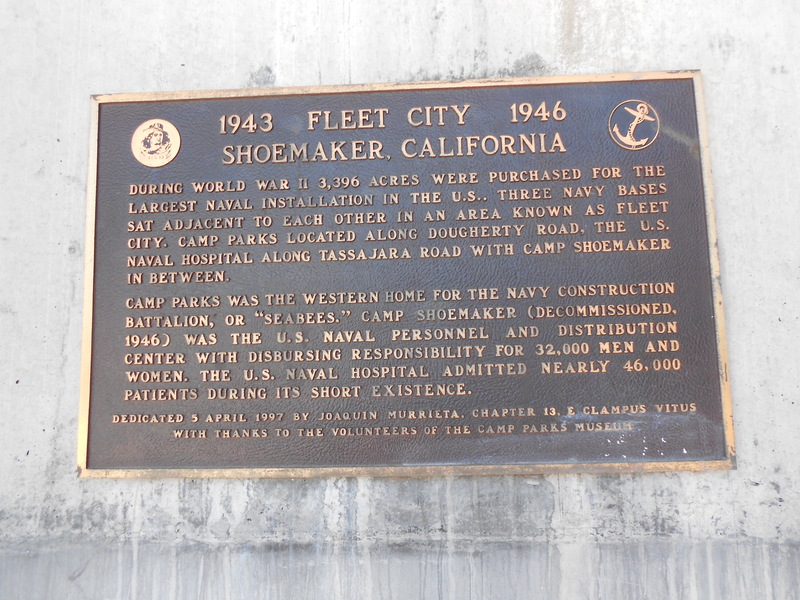 WAS THE U. S. NAVAL PERSONNEL AND DISTRIBUTION CENTER WITH DISBURSING RESPONSIBILITY FOR 32,000 MEN AND WOMEN. 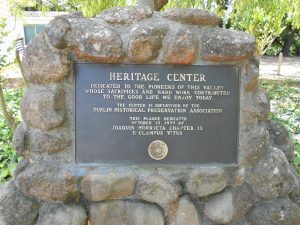 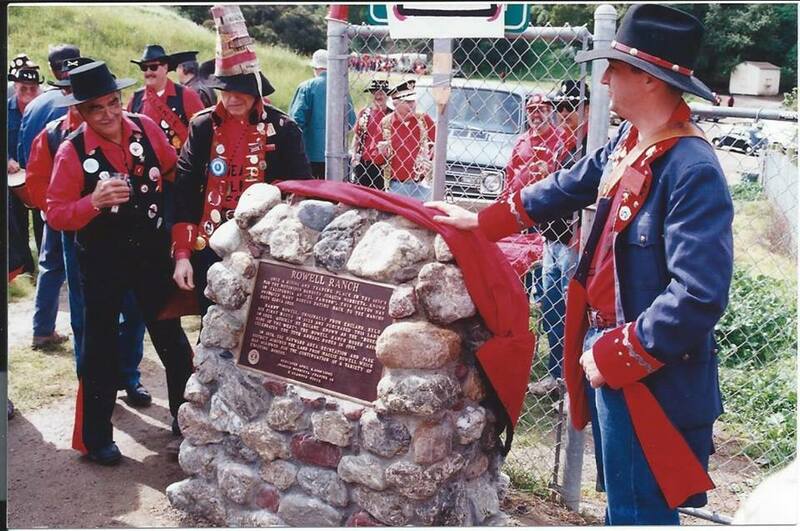 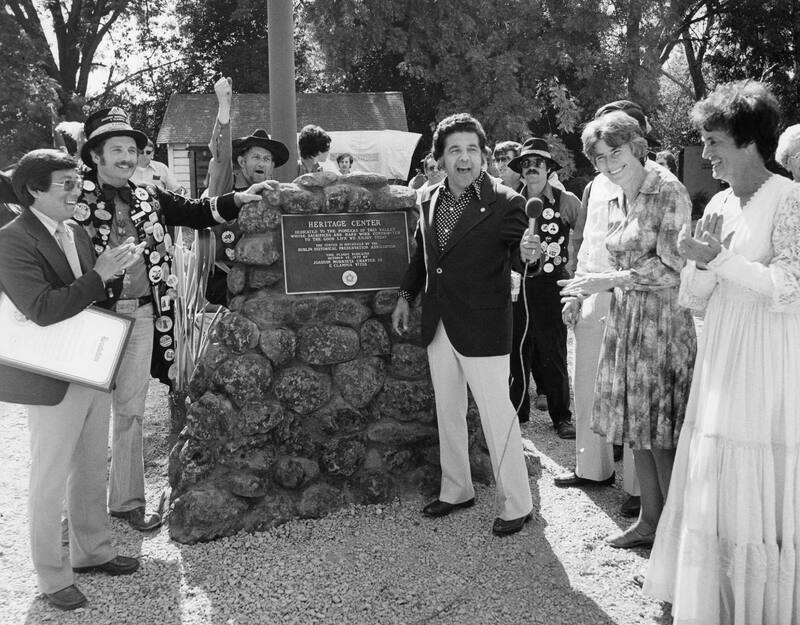 THE U. S.
DEDICATED 5 APRIL 1997 BY JOAQUIN MURRIETA, CHAPTER 13, E CLAMPUS VITUS WITH THANKS TO THE VOLUNTEERS OF THE CAMP PARKS MUSEUM. 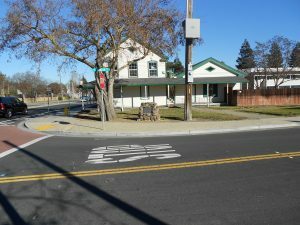 BANK AND UNOFFICIAL WELLS FARGO STAGECOACH STOP. 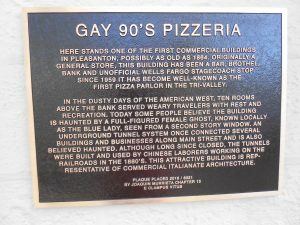 FIRST PIZZA PARLOR IN THE TRI-VALLEY. 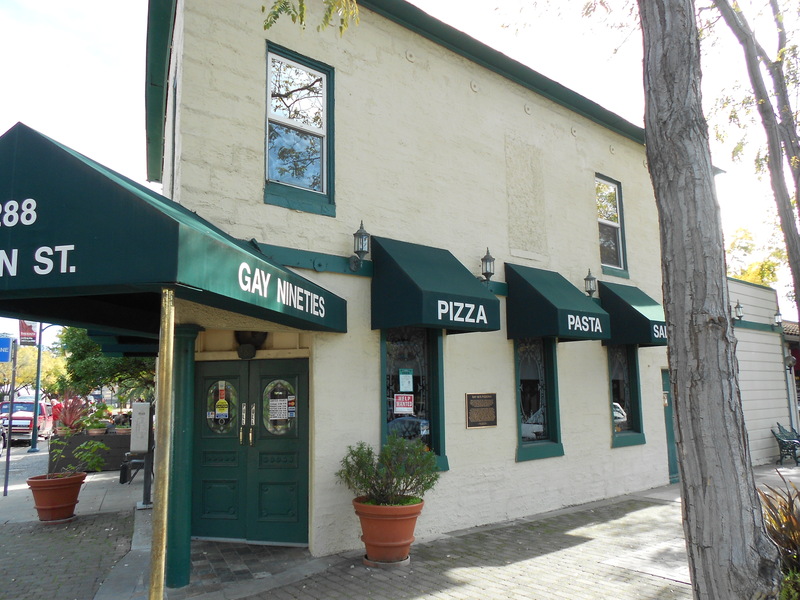 RESENTATIVE OF COMMERCIAL ITALIANATE ARCHITECTURE.